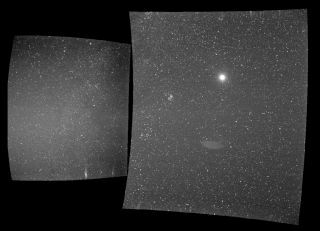 A camera aboard NASA's Parker Solar Probe captured these photographs looking back to Earth — the bright circle in the right-hand image — on Sept. 25, 2018. NASA's Parker Solar Probe will never return to Earth — but it can still look back on where it came from. On Sept. 25, the sole camera aboard that spacecraft, which launched on Aug. 12, captured a photo of Earth shining brightly in a field of stars. That camera is called WISPR (Wide-field Imager for Solar Probe) and is actually on board to allow the spacecraft to photograph the structure of the sun's upper atmosphere, the corona, as the spacecraft approaches — becoming the cosmic equivalent of a dashcam. The above image zooms in on Earth to reveal a lump on the right side of the planet — which marks the moon. But there's another secret hidden in the image. The scientists behind the mission zoomed in on Earth and spotted a strange bulge on the right side of the planet in the image. But Earth isn't really misshapen: That lump happens to be the edge of the moon, visible from behind our planet. When Parker Solar Probe captured this image, it was about 27 million miles away from Earth. Since then, it has continued its speedy journey toward the sun, thanks to a trajectory adjustment created by flying by Venus for the first of seven times. The $1.5-billion spacecraft is beginning a seven-year mission to study the sun in greater detail than ever before, with scientists hoping that the project will help them understand the incredibly hot corona and how the solar wind, a river of charged particles that flows off the sun, is formed. The mission is due to complete its first solar flyby on Nov. 5.